Around 13 side loaders are busy on the 40 hectare (around 100 acres) site of Butting, a well-known manufacturer of stainless steel pipes which can look back on a long history (founded in 1777 as Coppersmiths). The ever increasing size of loads, long transport routes and the challenging task of loading pipes packed in containers were the reasons why Logistics Manager Jürgen Meinecke got together with Herbst Fördertechnik in Brunswick and the OEM partner Baumann S.r.l. Cavaion Sideloaders to design the GCS 180118-17-4° SFH in only seven months. With an ultimate load (supported) of 18 tonnes at 900 mm horizontal load centre (15 tonnes at 900 mm horizontal load centre without support) it is probably the most powerful machine of its type in Germany. Equipped with a free lift mast for 5890 mm lift, KOOI-Reachforks® extendable forks (1700/1200 x 470 x 90 mm), hydraulic fold-out pipe brackets designed by the customer himself, the machine is on the move every day of the year, piloted by its regular drivers. Three Orlaco cameras provide additional visibility in every direction (particularly with forks extended) and when reversing. 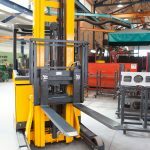 It can lift various dimensions of pipes, fittings and pipeline parts. With almost 1400 employees worldwide Butting is a leading manufacturer of special high quality pipes made of stainless steel. These pipes transport foodstuffs, natural gas and many other substances. In Knesebeck Butting produces every pipe diameter with wall thicknesses up to c. 70 mm and pipe lengths up to c. 24 m. The pipe lengths can be adapted to the loading capacity of trucks and containers. Weighing 27.3 tonnes and with a top speed of 25 km/h, the side loader is driven by a Rexroth Hydrostat RR 12sJ200 powered by a Tier III-Perkins motor 1106DE66TA combined with a Deutz Diesel Particle Filter D (fully automatic monolayer), a definite plus because of the frequent indoor use. Loads are weighed exactly by the Kilomatic Weighing System TC2000 which is important when loading vehicles. Baumann has introduced numerous features to this unique side loader which extend its life cycle considerably. The axle stubs are made of high quality steel 38 NCD, all compression bearings can be lubricated. The rod ends of the extending cylinders have a diameter of 40 mm and all hydraulic cylinders are fitted with screwed-in rod ends (for finer adjusting). 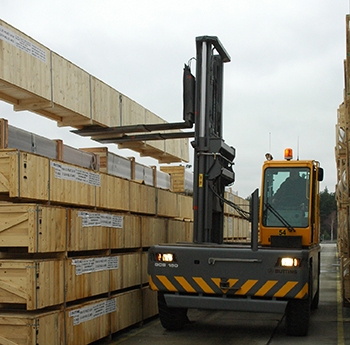 An adaptive buffer system reduces the impact loads on the frame, mast and the load itself. 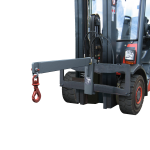 The coupling devices can be attached to front and rear and are able to pull industrial trailers. Safety is the utmost priority at Butting, therefore additional headlamps have been fitted to the mast and also integrated in the frame as headlamps for reversing. When reverse gear is selected, the rear camera, warning lights and an acoustic alarm are switched on automatically. The GCS180 will be deployed for 8 to 10 years and will be used for 2,500 to 3,000 working hours per year. Service and maintenance are provided by the dealership Herbst in Brunswick, headed by Alfred Herbst, which was also involved intensively in the design of the machine.